Toyin stormed Aigbe’s page to call her names as she said she was pushed to the extreme. Toyin while revealing the cause of her annoyance said that Mercy was in the habit of rejoicing whenever she sees her colleagues in trouble. Mercy was forced to lock the comment section of her page when fans sided with Toyin as the issue escalated. 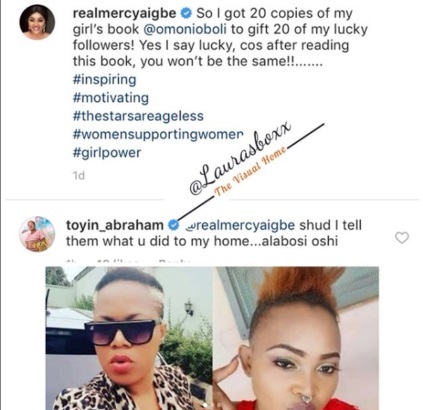 Toyin further alleged that Mercy who likes ‘famzing’ people runs to her page to write epistles whenever she sees her colleagues fighting. Many people who are having a boring day are expecting the two to go all out frontal against each other. 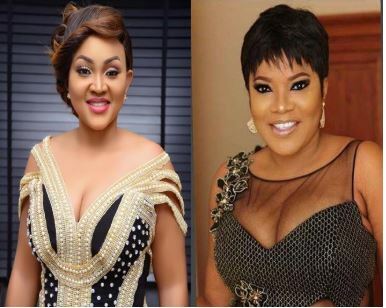 0 Response to "‘You’re A Big For Nothing Hypocrite’ – Actress Toyin Abraham Blasts Mercy Aigbe"